My delivery hadn't progressed for a week, so I emailed them. They told me I should call Australia Post. Australia Post tells me that HiSmile has only issued a manifest but didn't actually give them a physical parcel to send. So I email HiSmile asking them to follow up. They tell me to wait. So I wait. The delivery progressed as soon as I mentioned the issue to them. Then I email them asking for a resolution to my complaint, and why should I pay for delivery when they haven't delivered it on time, and I've had to spend time resolving their issue? They responded to tell me that I should visit nearby post offices to find my parcel. The delivery details clearly say it's in transit so why tell me to visit the post office? I have chronic health issues which make it difficult for me to leave the house and their treatment of me is plain cruel. They've not once offered to follow up on the whereabouts of my parcel or offered to treat me with any respect. It's one big cruel joke to them. I've paid for an item I haven't received, I've had to follow-up on the delivery that has never arrived, and they clearly get a rise out of torturing those with chronic health problems. Apparently, that's fun. I would be happy to share their email correspondence with the media. Not a good look. Very sorry to hear you are not happy. Someone from customer care has responded to your emails. Please let me know if you need any more assistance. They steal your money and don't have enough courage to even talk to you about their mistakes. They take advantage of innocent people that come to their site to put money in their pockets and instead they rip it from your hands and give nothing in return. Sorry to hear you feel this way. Please email one of our customer care team members at help@hismileteeth.com and we will be able to help sort out any issues. They steal money and do not send the product. They don’t respond to their emails and do not have a phone number. I am reporting to trading standards. Shameful company. HiSmile also stole my money. Don't waste time with there "support," they are useless and a rip-off. Avoid HiSmile, they are a total scam and post fake reviews everywhere. You can buy a much better and cheaper product on Amazon with reviews from real people who are not paid to do that. We're sorry that you have not had a pleasant experience with us. We are experiencing a higher than normal volume of customer emails and are responding to everyone as quickly as we can. Your patience is greatly appreciated at this busy time of year. I've seen your HiSmile company videos, unfortunately, it's too late for me. Why don't you stop talking about the millions of dollars of profit you've made while your ripping of customers like us! You can pay Instagram people for fake reviews but you can't look after your customers. Disgusting behavior, and whoever runs your crappy business has no clue or just in it to make a quick dollar. Their return policy is trash. 1. Take a clear photo of your teeth before using our products. 2. Use our products exactly as instructed. 3. Take a clear photo after you’ve completed all applications. 4. Email help@hismileteeth.com with the before and afters attached. 5. Once approved, send back your product. Please ensure that you take your before and after photo in similar lighting conditions as we will not approve your refund if there are drastic differences in lighting. Umm, that’s an approval process? So sad man. Thank you for reaching out to us and I am sorry to hear you are unhappy with our refund policy. We understand that every customer has different teeth and results may vary, which is why we introduced our money back guarantee to help customers who do not see results. We have these steps listed on our website in both the terms and conditions and the money back guarantee "help" section of our website. We believe we have made the process very simple and it is up to customers to read the policies and terms to ensure this goes smoothly for both our customers and our team. We do require both, before and after photos to process any applications under our money back guarantee, which I am sure you can understand, so that we are able to see the results and outcomes that customers have achieved while using the kit. This is to ensure we can offer customers as many options as possible to achieve the results they are hoping for! I can see you have been in email communication with us and we had approved your Money Back guarantee application for a refund. We would like to assist you further with this if you would like to email our Customer Care team at help@hismileteeth.com. In the United States money back guarantee, that means if you are unhappy for any reason, you can ship and return the product and receive a full refund. That is a bait and switch tactics and you know it. An approval process is not money back guaranteed. 1. a formal promise or assurance (typically in writing) that certain conditions will be fulfilled, especially that a product will be repaired or replaced if not of a specified quality and durability. You have had enough compliants, and the fact that you contine to use this wording, even though you know it is misleading to your consumers is shameful. How can you tell me to be satisfied with the lighting of my teeth? Then you are in Austrailia, so to ship something, that could be possibly lost in customs and then not even get your money back is ridiculous, because shipping to an island on the other side of the world is EXTREMELY expensive. I understand you are disappointed by this, however, as I am sure you can understand every company offering a money back guarantee has terms and conditions so that the policy is fair for all customers. The simple steps we have outlined are based on if our customers do not achieve results of 2 shades whiter. this is stated in multiple locations on our website and in order for us to see our customers results, we do require a before and after photo. As stated above, I believe your application was approved and from this, you are required to send the product back to us, which you have stated above is a requirement in the US also. As we are an Australian based company, it was stated at purchase that your order is shipping from Australia, and as we do not have a US warehouse, we require this product to be returned to us in Australia for a refund. We have had no issues with parcels getting lost in customs or returning parcels to us from the US in the past, and we do not believe this would be an issue upon returning your product. We recommend seeking different courier prices for shipping the product to Australia if you are concerned about shipping fees. I do urge you to contact our customer care team (help@hismileteeth.com) so that we assist you further with this. Even worse, a Youtuber posted on Twitter that HiSmile asked her to do a review but only if it would be a positive review. She declined because she had integrity. So there ya go! They would only send a product if they promised to do a POSITIVE review! Explain that KARLA! I have placed an order to HiSmile on the 16th of October 2017 and paid for next day delivery. It has been two whole weeks, and the customer team kept on saying that there has been a delay every single time I asked them. This is the worst experience I have had with any online purchase. The customer care replied as if they did not care about their customers. I am still waiting for my parcel. No answer via email and no product received when paid for express shipping. HOWEVER, you have taken my money! If I do not hear back from this company, I will be reporting to Trading Standards and my bank. I've also had the same bad experience. Lost my money! We need to let people out there know that HiSmile pays reviewers on Instagram and block everyone who speaks the truth. Good luck getting your money back, you might want to move quickly, I doubt they will be in business for too long. We are experiencing a high volume of orders from our Black Friday and Cyber Monday sales, so your order will take slightly longer to be dispatched, as I believe would have been stated in your confirmation email. Our customer care team have a higher than normal volume of customer inquiries at the moment from the sale period, so please allow at least 72 hours for a response. If you let me know the email address you emailed us from, I will make sure that you are responded to ASAP. They take so long to reply back via email, and there is no other way to contact them. 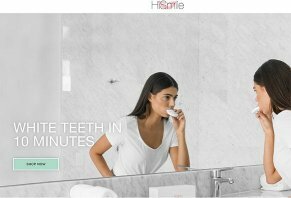 HiSmile is a scam because their products don’t work. I wouldn’t recommend anyone using their products because it is a waste of your time and money. Thank you for your message, I am disappointed to hear you have not received a response from us and are also unhappy with your results, I would love to assist you further with this! As I am sure you can understand, our office and warehouse were not active with the recent public holidays for Easter, and we ask customers to allow us just a little longer to get back to you. However, I am having trouble finding your emails with this name on here. I really would like to hear from you in regards to this review and your inquiry. Please contact us at help@hismileteeth.com and reference this review in your email subject so we can assist you as soon as possible. I saw HiSmile's products everywhere and thought that I would try it out. Everyone got good results and everything so it should work. I purchased it on the 14th of this month and got an email saying that the packed was being shipped and I could track it with a link in the email. Only to be thrown back onto my final order side to see a box where it said: "Direct Link tracking number: N/A." And there is no way for me to track my order. I thought that maybe something was wrong and emailed HiSmile about my problem tracking my order. I got an email back saying they had gotten my email and would be in touch soon. It has now been four days, and nothing has happened. I emailed them again today hoping for a response. I placed my order 13 days ago and it is still not dispatched! After numerous emails, I have asked for a refund as I fear that my item, which is a Christmas gift, will not be here on time!! I was told 7 days for a refund! This means I cannot replace the gift for another 7 days. They are quick to take your money but not give it back! I have pleaded with them in email and on Facebook and no one cares! I'm quite upset and feel like this is a scam. I feel for you. I also got scammed by HiSmile. They are a marketing con! Good luck getting your money back. Let me know if you had any luck. I'm still waiting months later! I can see that one of our customer care team members has processed a refund for you, which may take 2-5 business days to reach you. This is due to the bank holding the funds, which is out of our hands. I totally take back my last comment! I have finally received a refund just as my review was responded to! Good luck to everyone else trying. I had to fight for my money back. I ordered the HiSmile during the Black Friday sale on the 26th of November and my order was not dispatched on the 30th, which was bizarre since I PAID for express shipping. And when I complained the sales associate on live chat named Ashton did not answer my question or help me and as a result, I return to my emails just to find that HiSmile had resent my confirmation and delayed the delivery by 4 days! This is unreasonable. I paid to have my product ASAP. I feel scammed and definitely would not recommend to anyone as I am waiting for my order. And I mentioned to the sales associate that I am unable to receive it after the 5th of December as I would be overseas, but I was willing to pay more, but instead she just returned with an automated response and resent my confirmation. This is unfair as I ordered based on the guarantee that I would have my order by the 5th the latest, not SHIPPED on the 5th. They use Black Friday as an excuse yet I order off websites in America on the same day, and my order is scheduled to arrive this week, and I didn't even have to to pay for express shipping! I also have the exact same complaint, word for word. For my Black Friday order, I paid extra money for shipping, and I still haven't received it. It was a gift for my sisters birthday which was yesterday. They do not leave a phone number to reach them because they are cowards and do not have enough courage to talk to you about their failures and poor customer service. As I'm sure you can understand the Black Friday/Cyber Monday 30% off sale our warehouse has been doing the best they can in dispatching all orders. I can see that Ashton has helped you change your shipping address so it reaches you while you are away for the holidays! If you have any further questions, please feel free to reach out to us via email and one of our customer care team members will respond ASAP. I placed my order on November 26, and paid for express shipping. The confirmation email said it would be shipped on December 1. Last week I sent an email and was told it was being shipped in a day or two. It has still not been shipped! If the product exists, I hope it’s better than the company’s customer service! I am really sorry to hear that you have not received your parcel yet, there are slightly longer processing times for orders and we really do value your patience. I can see your order and I had one of our customer care team members follow you up with an email, which has some more specific information about your order to ensure this gets to you. I placed an order on December 14th and I still have not received the order. It is December 27th now, how long will it take? I am so sorry to hear that you have not received your parcel yet! Every country has a different shipping time frame and these timeframes exclude weekends and public holidays, which can result in parcels taking a little longer to arrive with this festive season. Our customer care team would love to follow up with you about some more specific tracking information for your order so that we can assist you as much as possible with getting this to you! If you are able to email help@hismileteeth.com and reference this review in the email so that we can get back to you as soon as possible. Their service is awful! I ordered my parcel the 21st of November and today, 15th of December, I am still without it! Seeing that the product is not arriving on time for having my teeth white for Christmas (and looks like forever??? ), I asked for a solution and they do not give any, only to let them know if I will want to return the product IF it arrives (and obviously, customer is liable for all returning shipping costs). It is not my responsibility! They specify on their website that the product arrives in 6-8 business days and the period is more than over, so I shouldn’t have to spend money over a product that I do not have! Please, DO NOT waste your TIME and MONEY with this company! I am so sorry to hear that you have not received your parcel yet, with our recent sale and peak period there are slightly longer processing times for orders. However, the shipping time frame is still 6-8 business days once your order has been shipped. I can definitely see your parcel has been shipped and is on its way to you! Our customer care team just followed up with you about some more specific tracking information for your order so that we can assist you as much as possible with getting this to you! Terrible company, terrible service! Do I even dare put this on my teeth? I've ordered my product with express delivery on December 3rd and today on the 19th of December, there's still nothing. I reached out twice, both of the times it was just some standard response of "peak period" and "will be with you shortly." Considering that I paid extra for the shipping to AVOID peak period, and then they tell me to reach out to customs is absolutely shocking. It is not my responsibility to make sure that my product is with me within the promised timeframe. Given that, the response and communication been so disgusting. I will just chargeback and you keep your product. I am sorry to hear you have not yet received your parcel! I've looked into your order, I can see you also spoken to our Live Chat team. I would love to assist you further with your order and I have just followed you up with an email with more specific tracking information for your parcel. I can see one of our customer care assistants has been in touch with you via email but we are happy to see that your order was delivered to you by Christmas!